Dr JC Rothwell, MRC Human Movement and Balance Unit, The Institute of Neurology, Queen Square, London WC1N 3BG, UK. A patient with no other neurological signs or symptoms presented with a prominent tremor restricted to the mandible. This 5-6 Hz tremor was interesting in that it was normally confined to the digastric muscles and was highly task specific. In the course of her normal daily activities, it began only when the patient drank from a cup or glass. The localisation of this tremor to a muscle that has no muscle spindles and no reciprocal inhibitory reflexes suggests that such tremors must be capable of being generated centrally. Accordingly, the study of a patient with a rare, task specific tremor that was usually confined to the jaw depressor muscles offered the possibility of gaining an insight into the neural mechanisms underlying tremors. The patient is a retired florist aged 61 who had first noticed her jaw tremor about 2.5 years previously. She reported that her tremor was most pronounced when she tried to drink from a glass or when her teeth were brought together, but that the tremor did not occur when eating. She complained of moderate inconvenience and embarrassment when drinking in public, although she does not think that the tremor is influenced by stress. Her general health is excellent, and she has no history of drugs other than hormone replacement therapy, no history of neurological disorder or illnesses, and no family history of tremors. Concentrations of thyroid stimulating hormone were slightly reduced, although T3 and T4 concentrations were normal. No abnormalities were present on MRI. The patient often awakes from sleep with a headache and sore jaws, consistent with nocturnal bruxism. Inspection of the teeth disclosed moderate tooth wear indicating a tooth grinding habit. On examination there was no visible tremor in the jaw when at rest; postural tremor of the outstretched arms was well within normal limits. The jaw tremor became pronounced (up to about 1 cm) only when the patient tried to drink from a glass or positioned her jaw to bring the incisal edges of her front teeth together. The tremor also occurred when one of us attempted to move her jaw passively into this position by hand, although it was not possible to be sure whether this was completely passive—that is, whether or not the patient unwittingly assisted this manoeuvre. The amplitude of the tremor made drinking virtually impossible, although her teeth did not usually come together during the closing movement. No overt tremor was seen when she clenched her teeth or opened her jaw as wide as possible. However, it was pronounced when she protruded her mandible and when she swung her jaw to the right, but not to the left side. She was unable to modify the tremor voluntarily, and reported that normal, social levels of alcohol consumption did not noticeably affect it. Electromyographic recordings were made from the left and right masseter muscles, and from the left digastric muscle using surface electrodes. Electrodes were not placed on the right digastric muscle, as cross talk from one muscle to the other was thought to be likely. Palpation disclosed a similar pattern of activity in the left and right digastric muscles during episodes of tremor. Temporalis muscle activity was not recorded, but no appreciable tremor was detected by palpation during jaw tremor. There was no activity in the muscles at rest. The figure (A) shows the pattern of muscle activity recorded when she tried to drink from a glass. The most obvious feature is a high amplitude, rhythmical bursting activity in the digastric muscle at about 6 Hz, whereas the electrical activity of the left and right masseter muscle records is minimal. A similar pattern was found when she placed her front teeth edge to edge. Both activities induced large tremors (0.5-1 cm) in the mandible. 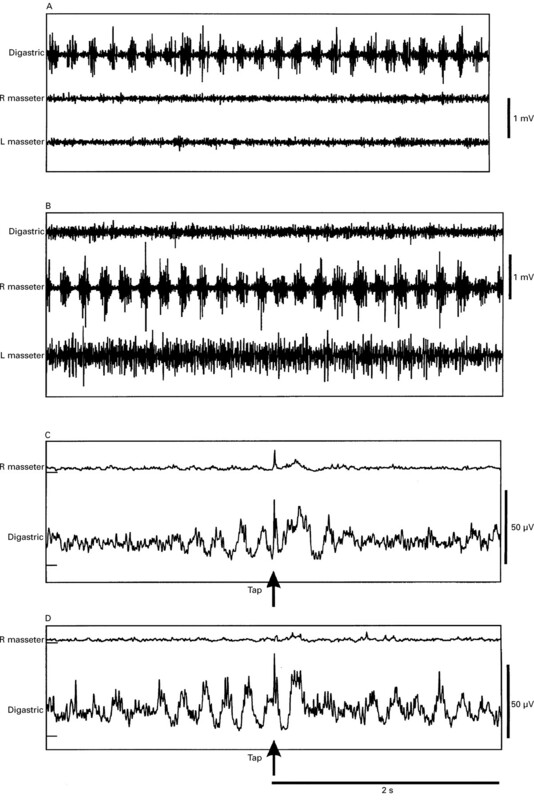 Electromyographic recordings from the left digastric and the left and right masseter muscles during jaw tremor. A and B are single sweeps of EMG in digastric, and left and right masseter muscles; C and D are ensemble averages of rectified EMG signals, triggered by chin taps given at the arrow with a tendon hammer. (A) EMG activity when drinking from a glass. The bursts of muscle activity are confined to the digastric muscle and were palpable bilaterally. (B) Rhythmical bursting restricted to the right masseter muscle, induced by a voluntary movement of the jaw as far to the left side as possible. (C) Averaged response to chin taps (n=19) given between digastric bursts. The first tremulous digastric burst after the stimulus is augmented by an additional, stimulus evoked response at about 90 ms, which makes this peak broader than the prestimulus peaks. After one further peak, the regular digastric bursting is suppressed for more than one second. The stimulus also evoked the usual short latency (10 ms) jaw jerk in the masseter muscle, which was followed by a small excitatory peak at about 90 ms. (D) Averaged response to chin taps (n=10) given during digastric bursts. The stimulus seems to produce an augmentation of the first poststimulus peak. Note that the digastric bursts are suppressed for nearly a second after the initial augmented burst at about 90 ms latency. As in C, the stimulus evoked a jaw jerk response in the masseter muscle which was followed by a small second peak at about 90 ms. Specific patterns of muscle activity were seen when the patient moved her jaw into other postures. During jaw opening, jaw protrusion, and strong clenching, all muscles were active without observable bursts or tremor. However, moving the jaw voluntarily to an extreme left position led to increased activity in all muscles, with clear rhythmical bursting in the right masseter, but not in the left masseter or the digastric (figure B). By contrast, there was no overt tremor or bursting in any muscles when the jaw was moved to the right. On occasion, bursting was present in both masseter and digastric muscles, and when this happened, the EMG bursts alternated between them. The jaw jerks in both masseters were normal, with a latency of about 10 ms. Chin taps given when the chin was not trembling (not shown) evoked an initial excitatory response in digastric that was synchronous with a burst in both masseters at a latency of about 90 ms. This signalled the onset of overt tremor, driven principally by the digastric bursts, but with some alternating masseter activity. Taps were also applied while the jaw was already trembling. Although a similar burst of digastric and (much smaller) masseter activity was evoked, it was followed by disruption, rather than augmentation, of the tremor for one second or so. The figure shows the disruption caused by giving the tap either in the pause between digastric bursts (C) or during the course of a single burst (D). When the tap was given during a digastric burst (D), the latency of the tap evoked activity was such that it was in phase with the next tremulous burst, and so augmented it. Later bursts were disrupted. When given between digastric bursts (C), the latency of the tap evoked excitation was such that it seemed to add on to the subsequent burst of tremor, making its duration about twice that of the prestimulus peaks. The most intriguing aspect of the present case was the fact that at times the tremor was limited to the digastric muscles without involvement of the antagonist masseter. The digastric muscles have no muscle spindles, and lack reciprocal reflexes with antagonist muscles.2 This implies that the tremor could occur without support from local muscle stretch reflexes, and therefore precludes the possibility that increased muscle spindle excitability during precise movements (for example, drinking) was the cause of the movements. Local cutaneous reflexes to the digastric muscle do exist, but are likely to be weak under the present conditions. If so, then we conclude that the tremor is best explained by activity in a central oscillator that drives the masticatory muscles at about 5 Hz. This is much higher than the frequency of normal chewing movements, so that we presume it is separate from the masticatory rhythm generator in the brainstem. Tremor also occurs in the jaw muscles during thermogenic shivering: however, by analogy with the limb muscles, it is likely that the antagonist jaw opening and jaw closing muscles are activated simultaneously during shivering, rather than alternately, as in this patient. The fact that afferent input produced by chin taps could influence the present tremor is not inconsistent with this idea of a central oscillator. It simply implies that although afferent input may not be necessary for tremor to occur, it is still capable of influencing ongoing oscillations. As with other task specific tremors, it is unclear why the tremor occurs only during such a limited range of possible movements. It may be that the activation of different muscles by the oscillator could depend on the command signal used to select different tasks. For example, the careful positioning of the mandible needed to drink from a glass may be considered a precision task, whereas chewing is more of a power task. These different types of movements engage different neural strategies and structures, and it is possible that the tremor is unmasked only during precision tasks. Alternatively, it is possible that motor neuron pools for different muscles are selectively enhanced or suppressed by particular afferent inputs when the jaw is moved to different positions. This could explain the lack of reflex activation of the masseter muscle when the digastric bursts pulled the jaw open. (1981) Tremor and clonus. in Handbook of physiology - the nervous system. ed Brooks VB (American Physiological Society, Washington DC), pp 325–344. (1979) Features peculiar to the trigeminal innervation. Can J Neurol Sci 6:95–103. (1984) Mandibular postural tremor during relaxation and during volitional innervation of the jaw muscles. Pflűgers Arch 402:76–82. (1979) Frequency analysis of human jaw tremor at rest. Arch Oral Biol 24:709–718. (1979) Primary writing tremor. Brain 118:1461–1472. (1979) Primary writing tremor. J Neurol Neurosurg Psychiatry 42:1106–1114. (1985) Essential voice tremor: treatment with propranolol. Neurology 35:106–108. (1975) The nature of primary vocal tremor. Can J Neurol Sci 2:195–197. (1987) Essential tongue tremor. Mov Disord 2:25–29. (1984) Atypical, rare and unclassified tremors. In Findley Lj, Capildeo R, eds. Movement disorders: tremor. (Macmillan, London), pp 85–93. (1987) Tremors of the smile. J Neurol Neurosurg Psychiatry 50:489–490. (1994) A study of hereditary essential tremor. Brain 117:805–824. (1992) Isolated tremor and disruption of the nigrostriatal dopaminergic system: an 18F–dopa PET study. Neurology 42:1554–1560.